This post was first published at JWeekly, The Jewish News of Northern California, and was written by Sue Fishkoff, J’s editor. Anger. Fear. Sadness. And a need to be together with others feeling the same. That’s what was expressed Saturday night at an Oakland vigil for the victims of Saturday morning’s anti-Semitic hate crime at a synagogue in Pittsburgh, Pennsylvania, where a gunman shot 11 people to death and injured four others. It was one of many such vigils organized nationwide by Bend the Arc, a Jewish social justice group. “I’m here because I’m horrified and angry, and I wanted the camaraderie of being with other Jews,” said Allison Goldberg of Oakland, who stood by the edge of Lake Merritt with some 350 other participants. Noting that her two children had attended a Jewish preschool nearby that had received two bomb threats, she said, “We live in a blue state, and maybe we felt protected from all this. But I don’t know how safe I feel. “I walk around with my white privilege, but what if I put on a yarmulke, or wear my Magen David,” she said, pointing to her large Star of David necklace. Martin Fassler, also of Oakland, stood next to Goldberg, nodding his head. The two had just met at the vigil. “We’re going to keep showing up for each other, as our allies have shown up for us tonight,” Noily said. Goldberg pointed to the Muslim-sponsored crowdfunding campaign launched today for the Pittsburgh victims, one of several such gestures made by American Muslim organizations. Other local memorials for the Pittsburgh Jewish community were held at synagogues and more impromptu locations, including one at the Contemporary Jewish Museum in San Francisco, also spearheaded by Bend the Arc. 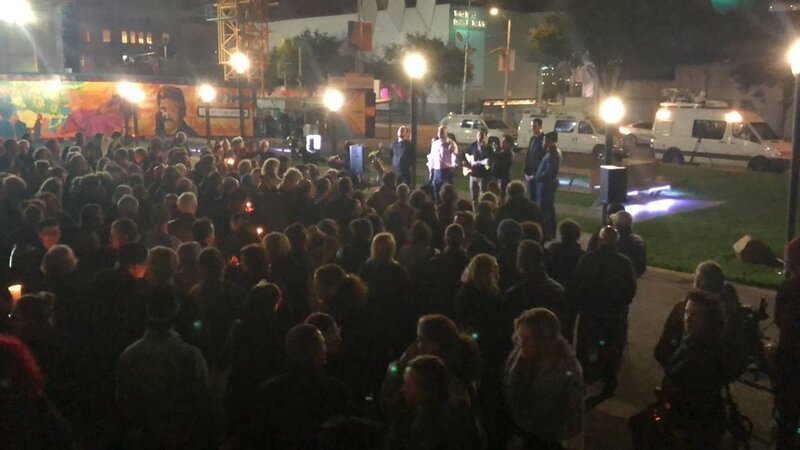 A large crowd gathered in the plaza in front of the museum at 8 p.m., the same time as the Oakland vigil, to listen to remarks from Rabbis Sydney Mintz and Ryan Bauer of Congregation Emanu-El and state Sen. Scott Wiener, among others. Emanu-El will host a memorial ceremony tomorrow, Oct. 28, at noon at its building on 2 Lake St. in San Francisco. Not everyone at the Oakland gathering was part of the local Jewish community. New Yorker Gina Piersanti was there with some friends from Mills College, where they are all students. She heard about it on social media, she said, and as a Jew she wanted to be there. “It was a hard day, but it’s nice to be able to mourn together with others,” she said, as her friend clasped her hand and nodded wordlessly. “There’s a feeling of allowing myself and our community to weep and wail and be angry about this,” said Tonda Case, an Oakland resident and board member of Bend the Arc. “And then to find our strength and get busy doing the work we need to do. Those leading the proceedings launched into the Havdalah prayer, as candles and spice boxes passed through the crowd. A few speeches, the blowing of a shofar, and the short ritual concluded with the singing of “Olam Hesed Yibane,” a liturgical song often used in protests, and the Jewish Renewal version of the prayer for healing. “Take care of each other,” organizer Sue Reinhold, a board member of Bend the Arc, exhorted the crowd.